G.S. 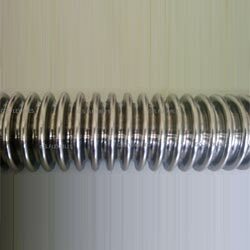 FLEXIBLES manufactures very SS Corrugated Hose. It has excellent crush resistance and offers excellent protection against axial elongation. In all the types, invariably heavy gauge of strip is used making it ideal for industrial and other demanding applications. Our Stainless Steel Flexible Hoses are designed and manufactured to very high quality standards. Our hoses are particularly appreciated for consistency in Mechanical strength, Pressure Rating and Dimensional accuracy. Can be used to transmit fluids in moving parts of machinery and equipment.